Neuroscience and business may not seem like topics that go hand in hand, but for Diana Robertson, the James T. Riady Professor of Legal Studies and Business Ethics, they are. Robertson spent most of her research career looking into why people behave ethically or unethically in organizations. As advances in neuroscience came to the fore, she became interested in using this technology to study how people process ethical issues. “The best part about this is that Penn has just incredible neuroscientists spread across the University. There’s some real expertise here, which is fun,” she said. Now, as a professor at Wharton, she shares these interests with her students. Robertson was looking into questions of compensation, control system, and codes of ethics when her interest shifted to neuroscience. She was conducting her research through surveys, asking participants questions relating to a certain scenario. “I came to feel that these attitude surveys just weren’t getting at behavior and they’re not getting at what people really think because there’s a great deal of social desirability in the field of ethics,” she said. The unknown process behind how exactly humans process ethics is what sparked Robertson’s curiosity in neuroscience. “We have intuitive reactions to ethical issues, but I wanted to know why,” she said. Human resources management, the first course Robertson taught at Wharton, aligned closely with that background. She began her academic career as a lecturer in the Management Department and was then asked to teach an ethics course in the Legal Studies Department. That’s when her research and interest in business ethics grew. Diana left Wharton in 1994 to teach organizational behavior at the London Business School and then management and organization at Emory University’s Goizueta Business School. She and her husband, Professor of Marketing Tom Robertson, returned to Wharton in 2007 when he accepted a position as Dean and she joined the Department of Legal Studies and Business Ethics. In order to address these questions, she brings in real-world problems. “I try to keep the curriculum as current as possible. Two years ago, I put up a picture of Tom Brady and a student shouts out, ‘He’s a cheat,’ and the woman behind him said, ‘No, he’s not,’ and they just started going at it. The first day of class!” she said. Each semester Robertson has her students debate over a topic relating to present-day issues. One topic she had students discuss was Uber’s ability to serve the best interests of society and another related to Philadelphia’s soda tax. “It’s not hard to connect with our students on issues that are fascinating. I try to come up with things that I think are very current and they will find interesting,” she explained. This year, debate topics include the use of autonomous vehicles and the recent decision by Harvard University to rescind admission to students based on offensive Facebook posts. 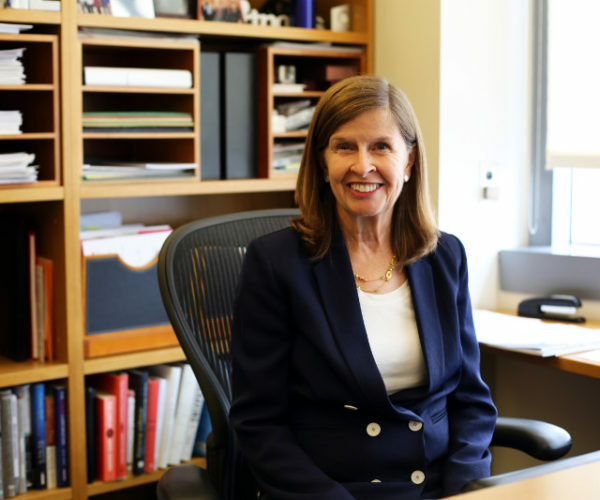 Robertson has found that her students are interested in neuroscience and so she tries to connect it to some of the behavioral ethics experiments that are happening at Wharton. As the doctoral coordinator for the Legal Studies and Business Ethics Department, Prof. Robertson helps PhD students figure out the coursework they need, mentoring them through the process, assigning them advisors, and helping them to navigate the job market. She’s been in the role for just over a year, and has found it incredibly rewarding so far.